Internationally renowned tenor Andrea Bocelli has been entertaining and thrilling audiences all over the world with his astounding voice for some 25 years, selling more than 20 million records, filling stadiums galore, and bringing joy to the masses. 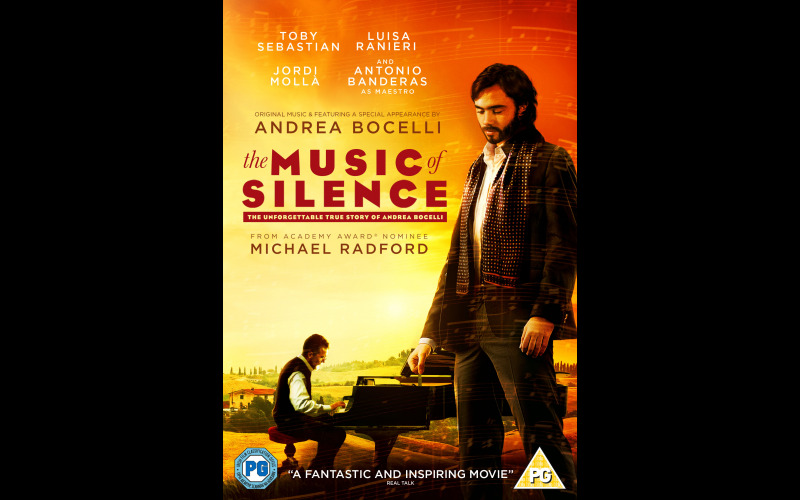 Starring Game of Thrones’ Toby Sebastian, Hollywood favourite Antonio Banderas, and an appearance from Bocelli himself, who also provides his angelic singing, The Music of Silence is now available on DVD and digital from 4Digital Media. Before he was Andrea Bocelli, he was Amos Bardi. Born nearly blind and gifted with a superb voice, Amos is separated from his family to attend an institute for the visually impaired, but a terrible accident occurs while he’s there, resulting in complete loss of sight. Despite being told that he will never be a serious opera singer, Amos is driven by great ambition and with the help of his maestro, overcomes every obstacle and achieves his first great success on stage. From there, he begins a life studded with victories and becomes one of the most renowned opera singers in the world.